Big Agnes Titan 6 mtnGLO tent is fully freestanding and lighted, with very strong DAC aluminum poles, two doors and two vents, suitable for 3-season use. Big Agnes Titan 6 mtnGLO. This tent has appeared on Amazon very recently, so follow the link and benefit from their efficient shipping service. This is a tent from a completely new series which Big Agnes launched for the 2019 season, so you have this 6-person and yet another 4-person tent. 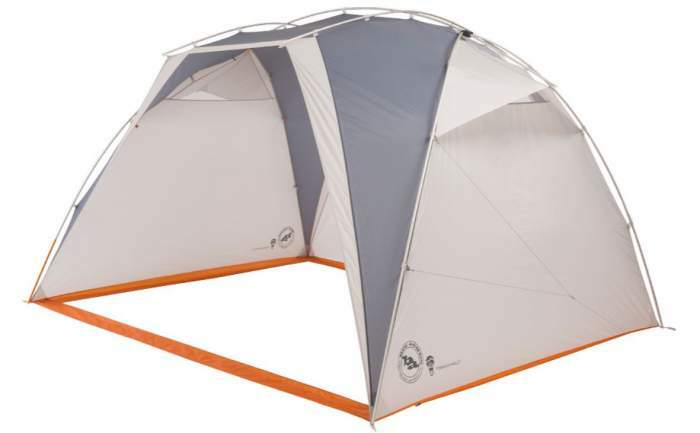 This is a double-layer configuration with an inner tent and a partial-coverage fly. This is a fully freestanding tent so you can pitch it anywhere but do not miss to stake it down if possible. The design is quite unique, with an external frame and with the fly that has those orange pieces of fabric (see the picture) that connect its two sides. So when you add the poles into the corners’ grommets, they create the structure which is completely self-supporting even before the tent is attached to it. What you see above is the fly and you realize that it has no vestibules, so it does not protect the two sides of the tent. But no worry those are waterproof just like the fly. You can use this configuration as a sunshade at a beach or in the garden at home. The inner tent is added from inside. So the tent comes with what they call the mtnGLO To-Go included. This is a patent-pending mtnGLO Tent Light Technology with durable LED lights to illuminate the interior of your tent. This is enough light to play cards and to sort your gear. It is activated by a simple push-button controller which has three settings – on, off and 50% brightness. Note that this is a removable system so you can use it also outside of the tent, or you can leave it at home if you carry the tent on the trail. There are multiple attachment points inside the tent so that you can position the light as it suits you best. It works on three AAA batteries (not included). There are more lighted tents here in the site and this tent is included in the list. Clearly, the suggested capacity makes no sense, this is a tent for a maximum of 3 people. The case without the inner tent on the right means being without protection from the rain (because there are no walls on the two sides, and you are certainly not protected from insects, spiders, snakes, and you name it. So this configuration is just a sunshade or rainshade and not for sleeping as the picture suggests. Seasons-wise & climate-wise, they declare it as a 3-season tent, and the waterproof rating and the poles are such that this sounds realistic. The structure looks strong but with such a fly design, I do not think this is a tent for very windy conditions. Regarding the weight, this is a lightweight tent with its 14 lb 5 oz (6.46 kg) trail weight. But as mentioned above, this is not big enough for 6 people and this makes it a bit heavy to carry on the trail for a smaller number of users. There are some lighter options for 6 people. The same holds for its packed size which is 29 x 16 x 9 inches (74 x 41 x 23 cm), so the tent is quite bulky. 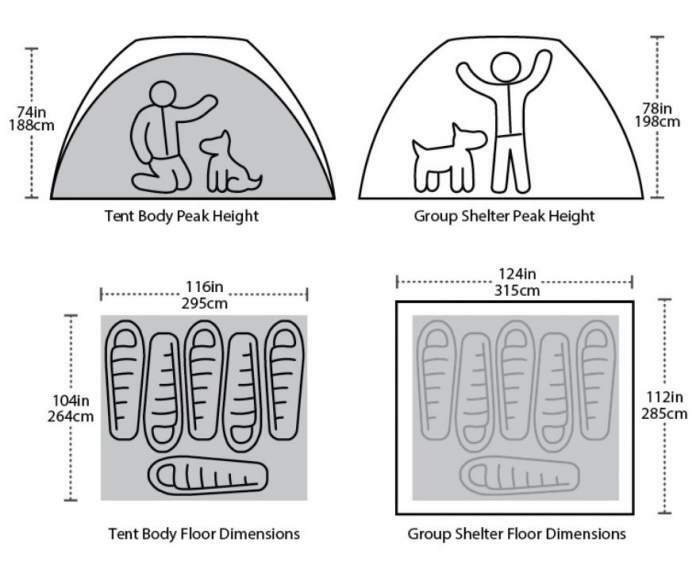 In view of these parameters, this is a tent for camping at places with a motorized access, but it can be transported on a bicycle as well. This is the DAC DA17 pole system and you have a hubbed design with the 14.5 mm main pole that is Y-shaped on both ends, so when you add it to the corners of the fly, the structure is freestanding with the fly under the pole. There are also two shorter cross poles with 13 mm diameter and they pull the fly on the two sides up, and this creates a high entrance and allows for views through the windows. So you realize that the poles are really strong for the tent of such a size. The fly is polyester ripstop and the floor is polyester taffeta. The tent body is polyester ripstop and polyester mesh. All of them are with 1500 mm waterproof polyurethane coating. All seams are taped with waterproof, solvent-free polyurethane tape (No PVC or VOC’s). The inner tent body clips into the fly. There are two vents on the fly, and there are also two windows on both doors and they are with mesh and panel. Some mesh areas are also on the protected parts of the inner tent. So you have plenty of options for ventilation and there is not much one could object to this design. Quick Stash doorkeeper on tent body door. Color-coded webbing and buckles for an easy setup. Ready to pitch; with pre-cut guylines and tensioners attached to fly. Multiple interior loops for use with gear lofts or for attaching other accessories. Side-release buckles connect the inner tent to the fly. 4 interior mesh pockets and 4 media pockets. 6 lightweight aluminum hook stakes. They sell a footprint separately, so you can use it in the sunshade configuration shown above and you will have a floor. You can use it also to protect the tent’s floor. Its weight is 1 lb 5 oz (595 g). The footprint can be ordered separately. Yet another option is the Big Agnes Vestibule for Titan 6 mtnGLO Tent which you see in the picture. The vestibule is sold separately. Trail weight: 3 lb 6 oz (2.89 kg). Packed weight: 3 lb 12 oz (1.70 kg). Packed size: 23 x 6 in (58 x 15 cm). Vestibule area: 71 ft² (6.6 m²). As you realize, this addition gives you a huge storage area for all your gear. Packed weight: 15 lb 7 oz (7 kg). This is the weight with everything included with purchase. Trail weight: 14 lb 5 oz (6.46 kg). This is the weight of the tent components necessary for setup and function. Fast fly weight: 10 lb 11 oz (4.85 kg). This is the fly, footprint, poles, and stakes (footprint sold separately). Footprint weight: 1 lb 5 oz (595 g). Dimensions: 124 x 112 in (315 x 285 cm). Area: 84 ft² (7.8 m²). Inner peak height: 74 (188 cm). Packed size: 29 x 16 x 9 in (74 x 41 x 23 cm). I have decided to show this tent side by side with two other models built with a partial coverage fly, and all are with the same declared capacity. Clearly, the other two tents are not a match for this tent but the difference in prices is huge and you will realize this if you follow the links in the table. I guess the price of this Big Agnes Titan 6 mtnGLO tent will be the main issue for many people, so if you are on a budget better check the models in the comparison table above. But if you can afford it, you will have a great tent. The lighting system adds lots of value and comfort. If you are able to invest into its vestibules, you can have two of them attached and this becomes a camping castle. This together with the mentioned sunshade configuration adds lots of versatility to this tent. There are some nice models in our list with lighted tents so have a look if this tent is above your budget. Note that I am not paid by the brand and have no relations with them. Please use the comment box below if you have questions or comments.